Posted on Tue, Mar 13, 2012 : 5:51 a.m. However, the council members made a revision to the document by removing the proposed name of the department, Washtenaw Fire and Rescue. What to call a proposed department that will serve the Village of Dexter and Dexter, Scio and Webster townships has been a stumbling block as Dexter Area Firefighters, residents and some Dexter Village and township officials have remained adamant that Dexter remain part of the name for the combined department. 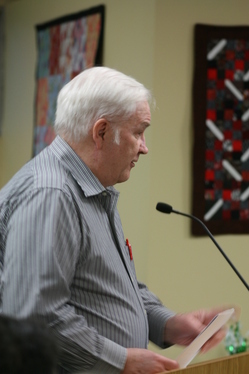 Monday night, longtime Dexter resident Robert R. Hoatlin told the Village Council that his father was the fire chief for the village for 25 years. He also expressed concern about the $125,000 it is estimated to cost to change the names on uniforms and apparatus. Hoatlin is not alone is his insistence that the history of the Dexter Fire Department be an important part of the future of a new regional department. In the last two months, as the proposal has gotten closer to implementation, there has been a flurry of concern about the proposed name change of the department. Council Member Ray Tell said he’d stopped by the Dexter Area Fire Department before Monday night’s meeting and there were 60-70 people celebrating St. Patrick’s Day. He said that he wanted to make sure that somehow 135 years of fire service history could be acknowledged. He said one idea would be to consider is a “legal name for the larger, regional department” while keeping each fire department’s name. He likened it to the Boy Scouts of America as a parent organization, yet each troop has an individual number. Keough is the chairman of a committee of elected officials from the Village of Dexter, Scio, Dexter and Webster townships who have been working on this plan for two and a half years, something that Carson wanted the Village Council to keep in mind. In fact, Cousins suggested Mid-Huron or Middle Huron as a name because it defines a broader area. However, he, too, wanted to see Dexter’s name included. “I won’t vote in favor of the concept with Mid Washtenaw on it,” he said. The document the Village Council approved Monday night details how the two departments would combine and a new regional fire department would be funded and administered. However, all four communities must approve the agreement before a combined fire department would be formed. Scio Township officials have already approved a resolution of support for the interlocal agreement. Dexter Township and Webster Township officials are expected to vote on it in the next month. Tue, Mar 13, 2012 : 4:48 p.m.
Cut the police, cut the fire department now surely our insurance fees for car and home are going to go up. I see so many cars breaking the law in Dexter, on Baker Rd. and on the highway....it is a free for all right now. Does the fire department really think they will be able to cover such a big area including I-94? Thu, Mar 15, 2012 : 2:06 p.m. Testing another reply in the same conversation. Disregard. Thu, Mar 15, 2012 : 2:05 p.m. Testing replies. Disregard this comment. Tue, Mar 13, 2012 : 5:15 p.m.
Tue, Mar 13, 2012 : 12:34 p.m.
Tue, Mar 13, 2012 : 11:57 a.m. The suggestion to consider a &quot;legal name for the larger, regional department&quot; was first presented over a year ago by DAFD Board Chairman Jim Seta. The elected officials of the committee completely disregarded Mr. Seta's suggestion and proceeded to push this &quot;Washtenaw Fire &amp; Rescue&quot; name. I am glad that they have finally come to their senses and are considering a solution that will continue the Dexter tradition of providing community service and fire protection in the region. Thank you Mr. Carson and all the other community leaders that helped the committee realize that the Dexter tradition needs to continue. Tue, Mar 13, 2012 : 11:56 a.m. It is unfortunate to say the least that the name is what is stopping this plan from moving forward. How can you have a unified department if all of the stations have a different name? There is already animosity between the various departments and that will only continue if the name is not changed to bring everyone under one roof. Tue, Mar 13, 2012 : 5:04 p.m.
Actually, yes. My husband has been a member of one of the departments for over 20 years. The departments have different ways of doing things and each thinks their way is best. I feel that if each department keeps its name, you will lose unity. A name carries a lot of weight. It also carries tradition either good or bad. I just feel that changing the name for all departments will be better moving forward. Tue, Mar 13, 2012 : 4:45 p.m.
Where is there animosity? You know this as a fact?! Tue, Mar 13, 2012 : 10:45 a.m.
&quot;Shawn Keough said one idea would be to consider is a "legal name for the larger, regional department" while keeping each fire department's name. He likened it to the Boy Scouts of America as a parent organization, yet each troop has an individual number&quot;. Hey look at that, a GREAT idea has been suggested. Why not make the regional department the &quot;parent company&quot; and allow each local branch to keep it's name. Everyone is happy AND the village saves $125,000 on changing the names on the uniforms, trucks, stationary, etc! That money would be much better used on other things, I vote yes!